I can't believe that another Father's Day has rolled around again! This year is just going way too fast. 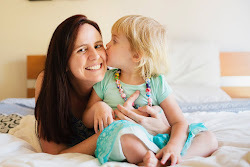 Before I know it I'll have a two year old and Miss M will be at school - eek! Anyway - just like last year, I've decided to bring you all some simple and sweet Father's Day craft and gift ideas. So if you haven't already planned anything - check these out! 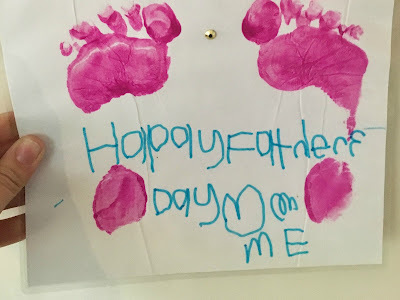 Miss M is old enough now that she has her own ideas for gifts and crafts, and because we do hand and footprints just about every year she wanted to do them again. Better yet this year, her writing is really coming along, so I thought that was a nice touch (I wrote and she copied). And the "Love ME" isn't actually what she meant to write. M is for her name and E is for her brother's name. She even did a "scribble" next to the heart so it looked like he did it haha! So considerate. I quite often make these nuts 'n' bolts photo frames with my students at school, and was actually surprised at myself that I hadn't done it with Miss M before. This is the 'before' photo, as in before we glued anything down. Sometimes it's a good idea to remove the glass first and just work with the actual frame itself to keep the mess to a minimum. Make sure you use a really strong glue and think carefully about the materials you're going to use to ensure they stick properly. You can also paint the frame too. (And never mind the upside down P that we needed to use as the second 'd' in Dad. I only had one of each wooden letter!). 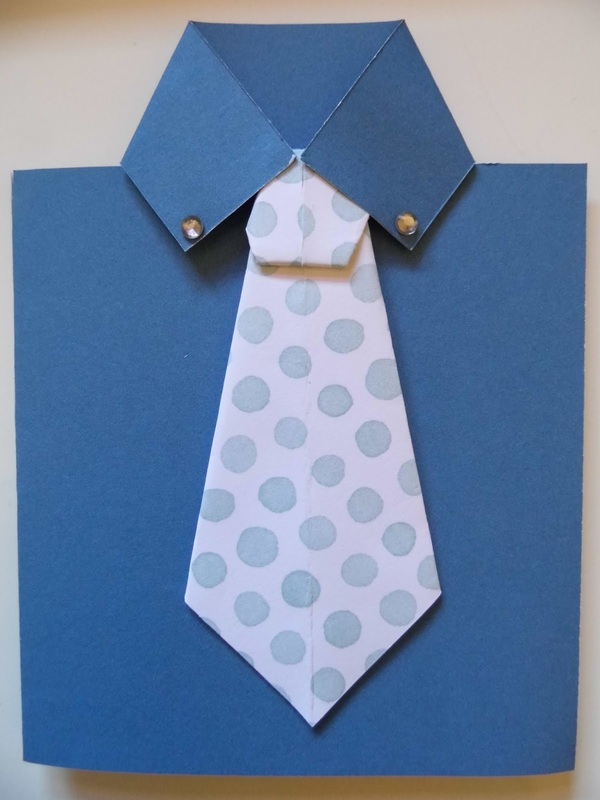 This year at school the Year 2 students are making these clever shirt & tie cards, and a little birdy tells me that they are also planning to make rocky road! James always tells me that dads will be happy with a gift they can eat rather than a trinket they feel obligated to display - haha! (Although secretly I know that he has a decorated photo frame on his desk at work). My friends over at Teach Starter have this fantastic collection of ideas. How cool are the tic tac toe rocks? And the "I love you to pieces" card is always a winner for Mother's Day and Father's Day! 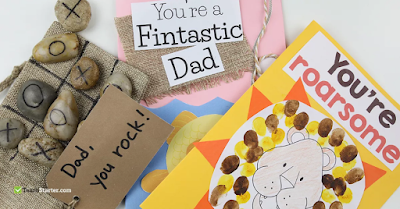 There are also some other fantastic Father's Day printables over at Teach Starter such as acrostic poems and cute cards. Now this idea I can't take the credit for - it was one of those gems that popped up in my Facebook feed from Top Teacher. 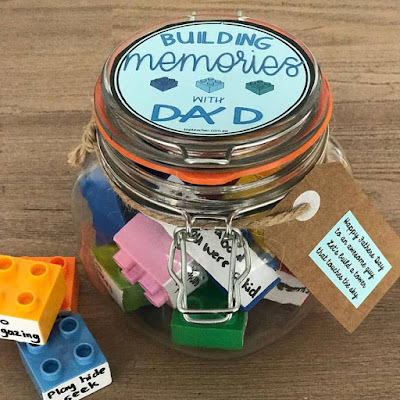 It's a "Building memories with Dad" jar. The idea is that your child tells you all different things they love to do with their dad, or funny memories they have, and you write it on a sticker or tape on a duplo brick. 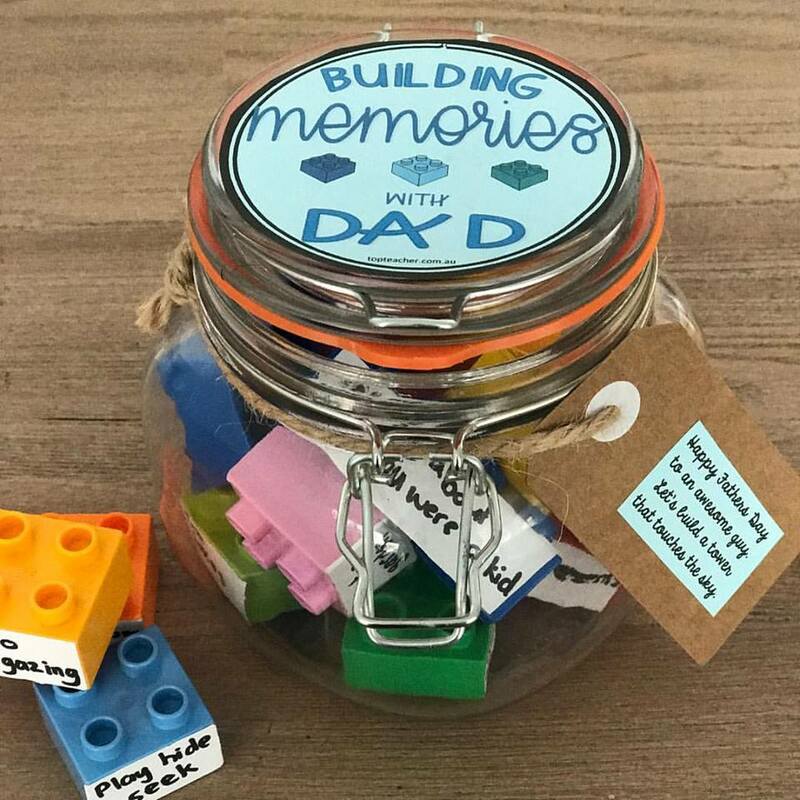 Then when given to dad, he and the kids can build their memory tower together. I absolutely love this idea! So sweet - but still cool enough for dads. So what do you have planned for Father's Day this year? I'm seeing my dad and brother on Saturday which will be nice to avoid driving all over Adelaide on Sunday - which is when we head to my sister in law's for some time with the Hunt family and my darling nephews. My dad and James' dad have helped us out so much with the kids this year, so we need to make sure we let them know how thankful we are. It should be a really nice weekend! So cute. My kids asked if they could decorate a shirt for their 'step dad' aka my bestie.